We love pool. 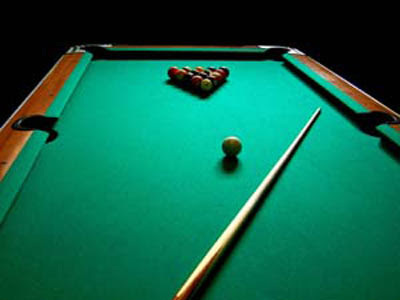 We play 8-ball, which is the most common of all the billiards games. I've tried 9-ball a couple times, but it's just not the same. At least 1-2 times a week, while in Holland, Shorty and I made our way out to our favorite watering hole, which uncoincedentally happens to be the best pool hall in the city (to our knowledge). Last night we went out for the 3rd time to play pool since we've been here in little Dewey, Oklahoma. Our journey took us from one of the better Mexican restaurants around, to 4 different little bars to find pool tables. The first was the place we managed to play 4 1/2 hours at last time called "Hoops". It's one of the more popular sports bars around, mostly because it's connected to the bowling alley. Also, Shorty used to work there, so it's a fairly familiar place for her. The 2 tables were taken, so we moved on. Next was a smaller bar in Bartlesville (sister city of Dewey). We pulled into this little bar called "Snockers", a karaoke bar on Saturdays, and a tiny stage for a live bands on Fridays. There we're about 10 patrons in this little hub, including two old fellas sitting next to the table we utilized for about an hour, watching us play, chatting with us some, and giving some comments here and there on our play. After that we moved on to a bar made up of a shed and lights pretty much, called "Icehouse", which happens to be the name of the malt liquor I used to indulge in when I was in college. They had 2 tables, and they were both taken, so we immediately took our business elsewhere. We moved to the only bar in Dewey, "Hitchin' Post". There were 4 people when we first got in there, and one dirty little pool table in the corner open, so we gladly entered and started to play. The group of 4 left after about 20 minutes, and the bar became ours. Just one old bartender with a massive Rolly fingers, Wouter Kabouter mustache (waxy twisted ends), his buddy "Magic" (half drunk old fella with 3 teeth who busted out sweet magic trick at the end of the night) and us. We played about an hour, never keeping score because we usually forget after game 10 what the score is, just have some fun. Chatted some with the Barkeep and Magic, then mosied on our way. We enjoy each others company, and others as well when playing pool. Our cousin Dan has become a pro in the past year since he started playing, and it's always good to mix it up and play others. Eventually, once we get our own place we are going to have a pool room, I think we might even invest in that before we get a bed.